the storm held off this morning so our trail ride was really fun... the sounds the horses' hooves made going through the mud was hilarious! i was up late last night with my dog, she's terrified of thunder... of course, my husband slept through the whole thing. i'm hoping we don't repeat that tonight! 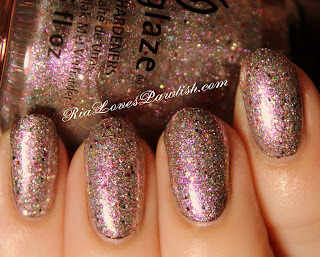 today's review is the final polish of the 2012 China Glaze Prismatic Chroma Glitters collection, Full Spectrum. this duochrome is a light lavender microglitter with a warm purple flash and lots of large multicolored glitter pieces. the microglitter also has different colors in it, but they aren't noticeable... the best thing is that the duochrome flash is quite strong, you can even see a bit of it in the swatchie! i used three thick coats, i could've gotten away with two, but adding the third really 'polished' it off (what a bad pun!). this one is the chicest of the collection, it's certainly appropriate for a fancy party or dinner. one coat Seche Clear, one coat OPI Black Onyx, three coats FS, one coat Seche Vite.